Anyway, we had a free night so Dean just wanted to walk around. 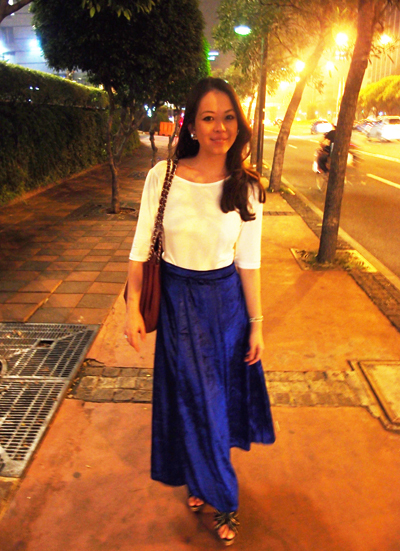 I let my hair down and just dressed simply; a white top, Kiss & Tell velvet maxi skirt, a shoulder bag and simple earrings. Just walking together is a moment. We’re so caught up with wedding stuff to settle that we’ve forgotten to enjoy each other’s company sans wedding talk. We laughed, we talked, we walked slowly and enjoyed every step. We saw a mother and child sleeping on the roadside, cuddled up in a thin cloth they used as a blanket. With leftover food and whatever spare coins people had to offer them. And I felt so so sad that I had to turn away to stop myself from tearing up. Dean turned to me after a few more steps. We really should. Sometimes we forget. We complain and complain about how we don’t have this and that, until we lose the ability to appreciate what we do have. Forget material things. That’s not what I mean. I mean the more essential things we overlook. We have all our senses. We can smell, we can taste, we can do anything. We have our healths to enjoy life. Appreciate that God is allowing us to be in the pink of health to do whatever we want. Appreciate that God has given us loved ones to share happiness, love and life. Appreciate that we have jobs to go to each morning. Appreciate that we are able to have food on the table and a bed to sleep in. Imagine if even one was taken away from us, like our ability to see things. Our lives would change in a second. I have everything I want and more. Loving and responsible parents, a happy family, a hopeful career. And soon, I will have a husband who, to me, is a wonderful one-in-a-million guy who happens to love me a whole lot. He is the person I will entrust my future with and I know he will care for me as God’s amanah to him. Things might not be peachy all the time, I know, but as long as we have God watching over us, we’ll be just fine. It’s nice to have faith, isn’t it? Things seem less scary. Gosh. So so much to be thankful for. Don’t know what I’ve done to deserve God’s mercy so far, but it’s definitely motivation for me to be a better person. What i love about Proudduck.com…is this kinda article. Love it. Alhamdulillah.. really love this entry! make a habit to be just praise Allah, Alhamdulillah everyday! every single day! ‘sujud syukur’ after solat would be great! be thankful for Everything! not just for the money or materials that u have, but for the life that Allah has given us! Ain’t it nice to know that we are still alive? that people we love, our family members are still alive.. yup! as simple as that! thank u vivy for this eye-opening entry! keep on writing! chaperone? so all the time u were studying and holidaying in the UK who chaperoned u guys?